they did a great job those Crown Lynn handpainters! They probably only had a sample to copy too.......? I've only ever seen one Cook & Serve casserole without a lid in all of my travels! I don't suppose you want to sell it, or swap it. I'll be in Auckland next week. Danzig is the only pattern I have seen that I do not possess. While tidying I found I DO have a Danzig and one is enough. PS I also found a few of my Rorstrand cups and Rorstrand Tango coffee set. Some pattern names: Fenix (h/p bird), Eden (h/p halved apple), King (h/p another bird), Curtis or Cedric or similar (I think, geometric), others buried around the place too. Is there any interest in posting pics? Photo courtesy of Banker to show this Mogambo coffee can that has the shading in reverse .....? I don't think I have underglaze mogambo in reverse but I do have reverse in hand-painted mogambo! Also various others with transfers upside down (I guess this is how they get reversed), notably saraband. do you have any idea what this might refer to? I just made a search and found no entries under this name. Having just built corner cabinets for my late father's Victorian glass (well maybe half of his 300 pieces) I just had one piece of wall area remaining in the dining room. I built an open cabinet of 3/8 (10mm) rimu just big enough to house six hand-painted cups and saucers on three shelves: this hangs by small brass chains from three rafters (two to brace and one to pull it against the wall) and is tied by a fourth to the chair rail. If I could remember the upload process I'd show you. Then I discovered where I could show one each of the remaining sixteen under-glaze and plain c&ss over two shelves which I have yet to hang. That leaves the Rorstrand cans to display display somewhere! I'd also like to show some sets, with coffee pots etc but have run out of room. When my brother and his family visit from Sweden in the summer I plan to assemble a 6 set of hand-painted Blue Tango c&ss with a Blue Tango coffee pot to take back and confuse the Swedes, who might think it is Rorstrand until otherwise advised. Please email photos to the site on newzealandpottery@gmail.com and I will post them for you, as I'm keen to see exactly what you've done with your coffee cans. There are a few Viking patterns on the Patterns Database and I will check them out when I get a chance and let you know what I can find. I'll see if I can get a decent picture tomorrow. I'll just be lazy and email. I'll try to get the other shelves up next week and get the full set on display on their saucers, even dig out Danzig! One last thing - Viking Pat.No. 458 is on the Database, but I've only ever seen the black coffee can saucers listed, hopefully the cups will turn up sometime. Form completes my inventory of patterns: what about colours? That gives a name to every pattern of C&S can I have now. Do the colours have names? As they appear left to right on the posted photo of my collection they are: the standard blue of C&S saucers; a lime green which sits on Form pattern saucers; the insipid beige/yellow seen on much CL; and the standard yellow of C&S saucers. Other colours of C&S saucer for which a name would be nice are the burgandy/red/pink of Mexico saucers and the brown of Napoli. Somewhere I think I also have grubby olive green one, but I don't know what cup that might belong to. I can't see any evidence of my having done this. I will attempt to do so tomorrow. My set is the later design that belongs with black ring saucers, not the red ones I have for my Tango cups. I will email but am happy for you to post. Regarding the name of the colour glaze colours, you will find the ones we have identified in the Patterns Gallery under Colour Glaze. 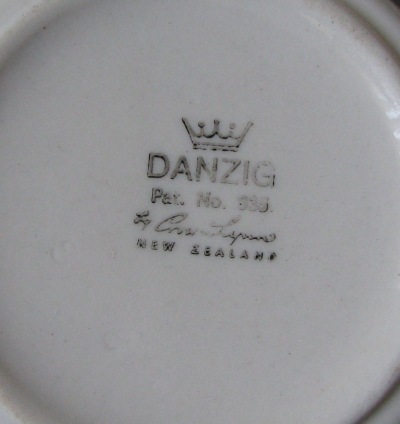 There are so many colours yet to be identified and there is a list of these colours in this topic - http://www.newzealandpottery.net/t876-colour-glaze-by-crown-lynn which shows the names that Crown Lynn used, but we still have to match up the colour with those names! Five of the 6 hand-painted Cook & Serve coffee can patterns, with the green stamp underneath, had matched saucers in plain colours (black, maroon, yellow, blue) bearing the same gree name stamp; Fleurette patterned cans had Fleurette patterned saucers. A range of C&S coffee cans may have been sold (1) with or (2) without saucers, for use as either as cup and saucer (1) or mug (2). I say this because they are so often seen without. A set of cans is a set of cans with or without saucers! Where u/g transfer patterns reproduce the hand-painted designs (Blue Tango, Image, Mogambo), I expect the saucer to follow the colour cues of the hand-painted duos. In matching an unnamed C&S saucer colour to a patterned coffee can there may have been a degree of choice from the outset, thus I see Saraband on yellow OR black as indicated near the start of this thread. Those with multi-coloured geometric patterns, Tacoma, Bermuda, and Athens look good on saucers of any of the colours included in their patterns, perhaps less so black. The only one of these patterns I've seen with a named saucer is Athens, which is blue. Some other patterns do appear to have had dedicated saucer colours, American Styled Blue Sapphire (a floral design) has named blue saucers. Ev has said that she remembers a set of Napoli on brown saucers. They certainly look good on the brown, but, curiously, (and I have no explanation for this) the only brown saucers I have have a GREEN c&S stamp. The only examples I have are (hand-painted) Fleurette (green stamp) and Form (no stamp on cup and black C&S stamp on saucer). I have these in blue, yellow, oyster, and lime. None has an understamp. I can only guess the saucer match. 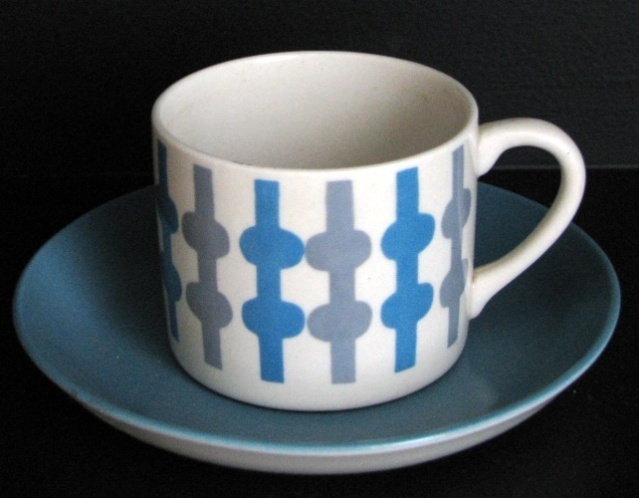 I see a great opportunity for harlequin sets, mix and match cup and saucer colours, as the matched duos are so boring. The only one of these I have bought with saucers are the lime which were paired with Form saucers, and together look better than Form on Form. In looking through my collection I see I have a pair of sauces with an as yet unnamed pattern. The pattern of three outlined fern leaves in black blue black is repeated four times around the saucer bowl. Understamp is black C&S. Blue cups look OK there, but I look forward to seeing cans in the same pattern. Somewhere around, I believe I have a grubby green Crown Lynn saucer that matches the C&S shape but I know of no cup, plain or patterned to match it. It is more usual to find cans without saucers than saucers without cans. If you have a saucer that fits, why not use it! I have a green "Made In England" saucer that nearly matches the Crown Lynn specification. I keep it with my collection because it fits. As Crown Lynn's Cook & Serve coffee can range was based on the (shape) specification for cans and saucers from Swedish maker Rorstrand they make a good match. As I write there is a set of six Rorstrand Tango pattern cans for sale on Crown Lynn saucers on trademe. Besides the Cook & Serve line Crown Lynn produced at least two other lines of coffee can of approximately the same size and shape (wider than high). The "530" range is approximately 4mm wider and 4mm higher than the C&S cans and slightly thicker material. The ring that sits in the saucer is set well in from the edge of the cup. The ceramic is white, but not vitrified china like C&S. 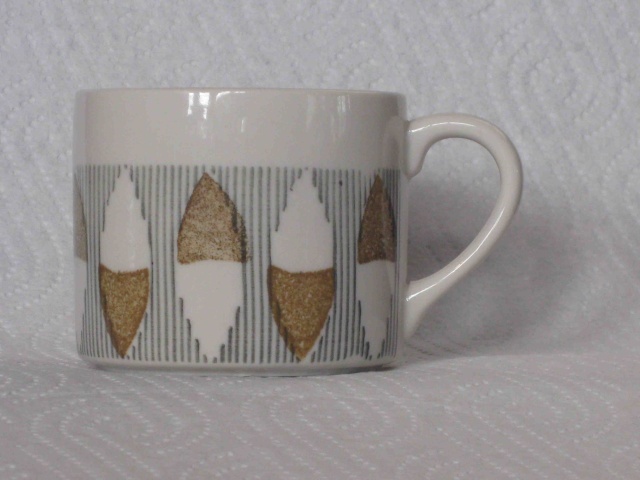 The patterns appear to be a transfer over crisp white glaze. This range is not as sturdy as Cook & Serve. I wouldn't put them in a dishwasher. Patterns inlcude 530 "Purple Myrtle", 531 "Arthur & Martha" (not yet illustrated in the patterns tables), and d532 "Captain Sharples". These three patterns are all a bit psychedelic, a bit "Yellow Submarine". My Purple Myrtles were issued on black colourglaze saucers in a box marked "Happenings". Another cup I have just located is the same size as the "530"s but has the bottom ring at the edge of the cup. 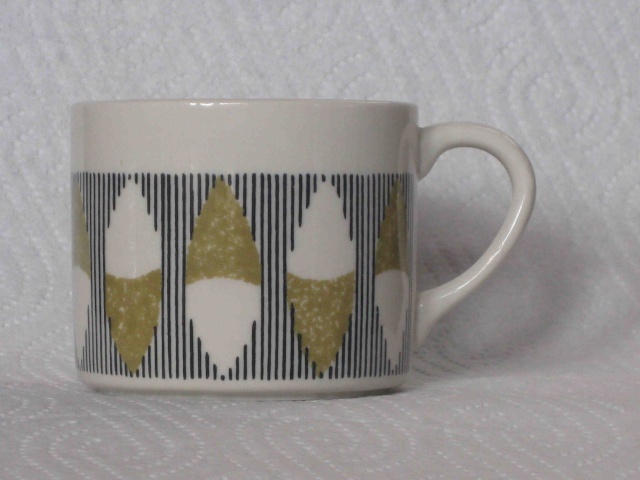 This example has a green transfer or print on or under yellowed white glaze (this pattern is not in the tables). 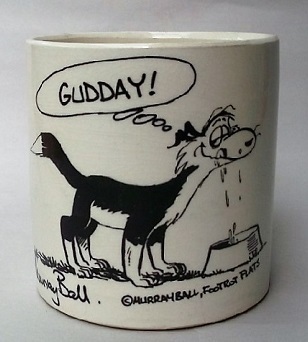 It has a black Kelston Potteries understamp. I'm sure I have similar cups somewhere here. Both these lines have reproduced the handle of the C&S can. Viking is pattern 458, what might this mean? If we accept some consistency, which may not be the case for Crown Lynn, a possible conclusion would be that Viking and Athens were both produced originally as hand-painted designs and later reproduced as u/g transfer. Their issuing as Kelston Potteries rather than Crown Lynn Cook & Serve muddies the waters. I hope one day to see some Viking cups, but do not expect them to be hand-painted. Those patterns marked below with one * were originally issued as hand-painted cup with green name stamp, on named plain colour saucers (except Fleurette which has a Fleurette patterned saucer). 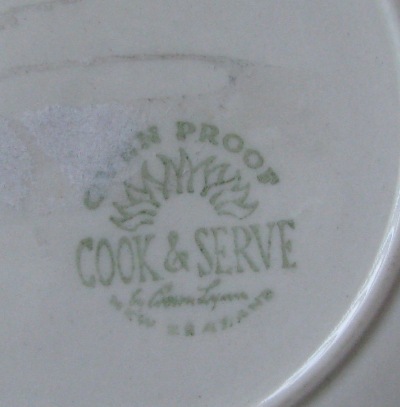 Those with ** were also later issued as underglaze transfers, black name stamp, on saucers green-stamped OVEN PROOF COOK & SERVE by Crown Lynn. No * indicates name in black under cup with green-stamp saucers as above. Exceptions: Danzig has Crown Lynn but not Cook and Serve on its stamp. Napoli appears to be an overglaze transfer rather than underglaze, and its stamp has Cook & Serve but "W.B. & Coy. Product" in lieu of Crown Lynn. My Form cups and Conifer cups are unstamped, as are some of my Athens. Some Blue Sapphire cups are incorrectly marked Saraband. Plain colour cups have (3 digit) impressions only, no black or green stamp. Patterned cups also appear to have an impressed alpha-numeric stamp but they are pretty unreadable. I have just made an inventory of my Cook and Serve cans and Saucers. The Tally is cans 201, saucers 154 (that I can currently locate). I have all those items listed above, in varying numbers from 1 to 15, including six sets (with correctly named saucers) of all the hand-painted except Fleurette, for which I only have 4 cups and two saucers. All but the unknown saucer pattern are illustrated above or elsewhere in the forum. If you have any I don't please add pictures, names numbers etc. Jeremy Ashford wrote: I have just made an inventory of my Cook and Serve cans and Saucers. That is a whole lot of coffee cans Jeremy and I'm just trying to visualise them all !!!! I'm very keen to see the pattern on the no name can that you have, so please send pics.